As I mentioned yesterday, there are many areas in my life that need to be more disciplined. Though I’d like to jump in and change them all, that inevitably leads to failure. So, instead, I plan to work on one habit each month in 2012. Somedays I honestly dont’ know what happens. There’s always one excuse or another. Before I know it it’s 10:00 and though the kiddos are dressed, I’m still walking around in my pajamas. This month I plan to change that. What about you? Is there a new habit, even if it’s small (like mine) that you are going to create this month? If so, I’l love it if you linked up or left a comment so we can encourage one another to become more disciplined women. I was planning to post this before the dawn of 2012. My computer died and it just didn’t happen. Even though it’s late, I’d better practice what I preach and not let perfectionism paralyze my plans. I have this image in my mind of an “ideal me.” A me that always gets up early to read my Bible and exercise, gets dressed long before 11 am, never runs late, spends hours each week just reading and treasuring my kids, has a nourishing and yummy dinner ready to pull out of the oven when my husband gets home, and, well, the list goes on and on. I am miles from my own ideal. On time? Those words are hardly even in my vocabulary. On the one hand it is okay. The highest calling of a Christian is to love and worship our King. You can worship in your pajamas while stepping over loads of laundry to get dinner in the oven. But each of us has an earthly calling too. As a wife and mother I am called to wisely build my home. Trying to tackle a hundred habits all at once almost certainly will fail. Crystal, in her excellent series 21 Days to a More Disciplined Life challenges us instead to implement one habit at a time. That is what I plan to do in 2012. Building new habits takes time. Lots of time. Research shows that it takes about 21 days to develop a new habit. I’m going to give myself a month. Each month in 2012 I will choose one habit that would help me carry out my calling better and prayerfully seek to cultivate that habit. Of course our habits will look different. Each home has its own unique culture and that’s a glorious thing! Each of us have our own strengths and weaknesses. A habit that would really benefit my family might not be good for yours. But we could all encourage one another as we seek to become more disciplined women of God. The first weekday of each month (or tomorrow, in this case! ), I’ll list the habit I will be working on with a linky for those that want to join me. On the last weekday of the month, I’ll post my progress (hopefully!) and what I’ve learned, with a linky for you to join me. Don’t have a blog? We’d love to have you join us in the comments. Striving too hard for perfection sometimes keeps us from doing anything at all. I’m reminded of the wicked servant in the parable of the talents. The King gave gold to each of his servants. The wise servants went out, worked and traded and earned more. The wicked servant, for fear of messing up, buried his gold in the ground. Far too often I am like that wicked servant. Instead of following through, I think and dream and stew. I spend so much time trying to perfect a goal or come up with a perfect schedule that there’s not enough time to actually carry it through. I decided to teach my daughter a Christmas themed-poem. I just needed to find one. Days and weeks passed as I read poem after poem trying to find the perfect one for her. One was too long and another too short. Others carried the wrong message. Finally I settled on a poem, but by this point there wasn’t enough time left before Christmas to teach it to her. My insistence on finding a perfect poem robbed us of time to actually learn any poem. Unfortunately, perfectionism doesn’t just create problems learning Christmas poems. Many areas in life can be affected. Stressing about having the absolute best curriculum can lead to not wisely utilizing what we do have. Some decisions require hours of prayer, soul-searching and seeking advice. Often however, we need to stop worrying about having everything absolutely perfect and just diligently act. Now. Every time we shop, it is like we are stepping into the voting booth. Each purchase made (or avoided) is a vote, whether made consciously or not. A vote for Walmart or the farmer down the road. A vote for a new dress or money put towards a student loan. We are a consumer driven society. Our purchases change the marketplace. It is just a small example, but in less than three years, consumer demand changed the type of milk offered in local stores. Three years ago, only one store carried RBGH/RBST free milk [milk that’s free of these artificial growth hormones.] The FDA position hasn’t changed, but now even store brand milk displays a hormone-free sticker. What happened? Consumers demanded change. Fellow milk lovers and I went out of our way to buy hormone-free milk at the one store that carried it. My guess is the other stores wanted our business back! I would support cottge [home based] industries so that more women could contribute to the family income while pursing the best job on earth, making a home! But shopping is a balancing act. We must juggle budget and convenience, quality and quantity. That is part of why I choose to shop at our local thrift store. It’s economical. But it is also a vote for less waste and less consumerism. It’s a vote to support a local charity. It is a vote to reuse what still has plenty of life left in it. It is a vote to free up money to save or put towards student loans or purchase higher quality beef or handmade crafts. We may not always be able to pursue our first choice in every purchase we make, but it is so exciting that we can make a difference, however small. Our purchases are a tiny vote cast in the ballot of the marketplace. Want to join me in supporting home based gifts this Christmas season? 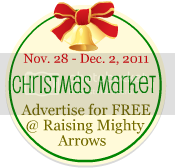 My real life friend Heather, from Raising Mighty Arrows, is hosting a virtual Christmas Marketplace! I have seven younger siblings. All of them live a day’s drive away. This week I got to spend time with three of them, and have been far too busy sipping coffee, talking, watching girlie movies, playing at the park, and enjoying their company to blog much. The day they arrived was shaping up to be a busy day. Very busy. I had to get ready for the class I tutor, go shopping, and prepare for their arrival. Plus all the daily tasks with three little ones to love, train and teach. The list of “must dos” was long and getting longer. I just really, really don’t need another mess right now, I thought. God knows what I need. I don’t. The list is different for all of us. It’s usually full of good things, but God knows what we really need. I need the extra mess or interrupted sleep to remind me to not trust in my own strength. To teach me to lean on Him. I’m a very slow learner. But God is patient with me and gives me lots of reminders (often through a dimpled round-faced child) because He knows what I need. This is cause for rejoicing. Whether in petty problems or true trials, God knows what we need.